Rosa Hartley is 20 years old and currently in her second year of the Bachelor of Music programme at the Royal College of Music, studying with Professor Itzhak Rashkovsky. She began her violin studies at the age of 5, joined the junior department of the Royal Northern College of Music at the age of 9 and then attended Chetham’s School of Music to study with Wen Zhou Li. 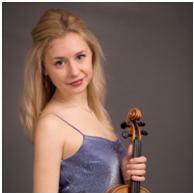 As a soloist, chamber musician and orchestral musician, Rosa has performed at some of the UK’s top concert venues – Cadogan Hall, Royal Festival Hall, Birmingham Symphony Hall and Bridgewater Hall – and international engagements have taken her to France, Italy, Norway, Slovenia and China. In addition Rosa has taken masterclasses with renowned violinists and teachers Pierre Amoyal, Mi-Kyung Lee, Mauricio Fuks and Leonid Kerbel. Rosa has also received a number of awards and prizes including the BBC Performing Arts Bursary, Katy Jones Memorial Prize for Performance, Leverhulme Scholarship, Vibrato Foundation Scholarship, and Ida Carroll Bursary Awards.